...I met a person who asked me a smart question. ...and he wanted to add a check mark for every customer to whom he met. Well, I showed him a simple way and he was happy with that. But eventually today morning, I thought maybe there is more than one way to insert a checkmark in a cell. And luckily, I found that there several for this. ...and all those situations where we need to use these methods. ...I have also mentioned how you can format a checkmark + count checkmarks from a cell of range. 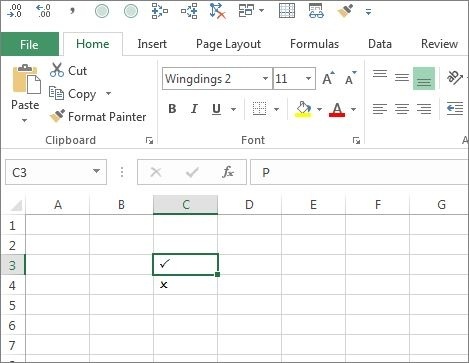 In Excel, a check mark is a character of wingding font. So, whenever you insert it in a cell that cell needs to have wingding font style (Except, if you copy it from anywhere else). These methods can be used in all the Excel versions (2007, 2010, 2013, 2016, 2019, and Office 365). A check mark or tick is a mark can be used to indicate the “YES”, to mention “Done” or “Complete”. So, if you are a using a to-do list, want to mark something is done, complete or checked then the best way to use a checkmark. Below are the ways to insert a check mark in Excel. You just need to use the method which you think is convenient for you. And here are some of the things which you need to know about using a checkmark in Excel. The Fastest Way to Add a Checkmark is the Keyboard Shortcut ? Nothing is faster than a keyboard shortcut, and to add a check mark symbol all you need a keyboard shortcut. The only thing you need to take care: the cell where you want to add the symbol must have wingding as font style. And below is the simple shortcut you can use insert a check mark in a cell. Select the cell where you want to add it. Use Alt + 0 2 5 2 (make sure to hold the Alt key and then type “0252” with your numeric keypad). Just select the cell where you want to add it. Use Option Key + 0 2 5 2 (make sure to hold the key and then type “0252” with your numeric keypad). If you usually don’t use a checkmark then you can copy-paste is from somewhere and insert in a cell. In fact, it’s a big time saver as well. Because you are not using any formula, shortcut or VBA here (copy paste a check mark from here ✓). Or you can also copy it by searching it on google. The best thing about the copy-paste method is there is no need to change the font style. There are a lot of symbols in Excel which you can insert from Symbols option, and the check mark is one of them. First, you need to select the cell where you want to add it. After that, go to Insert Tab ➜ Symbols ➜ Symbol. Once you click on the symbol button, you will get a window. Now from this window, select “Winding” from font drop down. And in the character code box, enter “252”. By doing this, it will instantly select the check mark symbol and you don’t need to locate it. In the end, click on “Insert” and close the window. As this is a “Winding” font, and the moment you insert it in a cell Excel changes the cell font style to “Winding”. ❤ Apart from a simple tick mark, there is also a boxed check mark is there (254) which you can use. If you want to insert a tick mark symbol in a cell where you already have text, then you need to edit that cell (use F2). ⚠️ The above method is bit long, but you don’t have to use any formula or a shortcut key and once you add it into a cell you can a copy paste it. After the keyboard shortcut, the fast way is to add checkmark/tick mark symbol in the cell, it’s by creating AUTOCORRECT. In Excel, there is an option which corrects misspelled words. So, when you insert “clear” it converts it into “Clear” and that’s the right words. ...and you define a word for which you want Excel to convert it into a check mark. First, go to the File Tab and open the Excel options. After that, navigate to “Proofing” and open “AutoCorrect” Option. Now in this dialog box, in the “Replace” box, enter the word you want to type for which Excel will return a check mark symbol (here I’m using CMRK). Then, in the “With:” enter the check mark which you can copy from here. From now, every time when you enter CHMRK Excel will convert it into an actual check mark. There are a few things you need to take care which you this auto corrected check mark. When you create an auto correct you need to remember that it’s a case sensitive. So, the best way can be to create two different auto corrects using the same word. The word you have specified to be corrected as a check mark will only get converted if you enter it as a separate word. Let’s say if you enter Task1CHMRK it will not get converted as Task1. So, the text must be Task1 CHMRK. The AUTO correct option applied to all the Office Apps. So, when you create a autocorrect for a check mark you can use it in other apps as well. If you want to save your efforts and time, then you can use a VBA code to insert a check mark. Pro Tip: To use this code in all the files you add it into your Personal Macro Workbook. …here’s how this code work. When you select a cell or a range of cell and run this code it loops through each of the cells and changes its font style to "Wingdings" and enter value “ü” in it. This is a PRO tip which you can use it you likely to use this code more often in your work. First, click on the down arrow on the “Quick Access Toolbar” and open the “More Commands”. Now, from the “Choose Commands From” select the “Macros” and click on the “Add>>” to add this macro code to the QAT. Double-Click Method using VBA ? Let’s say you have a to-do list where you want to insert a checkmark just by double clicking on the cell. Well, you can make this happen by using VBA’s double-click event. First, you need to open the VBA code window of the worksheet and for this right-click on the worksheet tab and select the “View Code”. After that, paste this code there and close the VB editor. Now, come back to the worksheet and double click on any cell in column B to insert a checkmark. …as it has already applied the font style to the cell. And if a cell has a check mark already then you remove it by double clicking. If you want to be more awesome and creative, you can use conditional formatting for a check mark. Let’s say, below is the list of the tasks you have where you have a task in the one column and a second where you want to insert a tick mark is task is completed. First, select the target cell or range of cells where you want to apply the conditional formatting. After that go to Home Tab ➜ Styles ➜ Conditional Formatting ➜ Icon Sets ➜ More Rules. Select the green checkmark style from the icon set. Tick mark “Show icon only” option. Enter “1” as a value for green check mark and select number from the type. …without the actual cell value. If you want to apply this formatting from one cell or range to another range you can do it by using format painter. …and insert a checkmark using that drop down. Before you start make sure to copy a checkmark ✓ symbol before you start and then select the cell where you want to create this drop down. First, go to Data tab ➨ Data Tools ➨ Data Validation ➨ Data Validation. Now from the dialog box, select the “List” in the drop down. After that, paste the copied check mark in the “Source”. …simply add cross symbol using a comma and click OK.
There’s one more benefit which drops down gives that you can disallow any other value in the cell other than a checkmark and a cross mark. …select the type, title, and a message to show when a different value is entered. Not all the time you need to enter a check mark by yourself. You can automate it by using a formula as well. Let’s say you want to insert a checkmark based on a value in another cell. Like below where when you enter value done in column C the formula will return a tick mark in column A. To create a formula like this we need to use CHAR function. CHAR function returns the character based on the ASCII value and Macintosh character set. …you can learn more about it from here. As I say CHAR is a function to convert a number into an ANSI character (Windows) and Macintosh character set (Mac). So, when you enter 252 which is the ANSI code for a check mark, the formula returns a checkmark. If you are using OFFICE 365 like me, you can see there is a new tab with the name of “Draw” there on your ribbon. In this tab have the option to draw directly into your spreadsheet. There are different pens and markers which you can use. …and Excel will insert it as a graphic. The best thing is when you share it with other it, even if they are using a different version of Excel, it shows as a graphic. There’s also a button to erase as well. You must go ahead and explore this “Draw” tab there is a lot of cool things which you can do with it. A checkbox is an object which is like a layer which placed above the worksheet, but a checkmark is a symbol which you can insert inside a cell. A checkbox is a sperate object and if you delete content from a cell checkbox won’t be deleted with it. On the other hand, a checkmark is a symbol which you inside a cell. If you use Excel’s online App then you need to follow a different way to put a checkmark in a cell. The thing is, you can use the shortcut key but there is no “Winding” font there, so you can't convert it into a checkmark. Even if you use CHAR function it won’t be converted into a checkmark. I’ve found a simple way by installing an app into the Online Excel for symbols to insert checkmark. First, go to the Insert Tab ➜ Add-Ins and then click on the office Add-Ins. Now, in the add-ins window, click on the store and search for the “Symbol”. Here you’ll have an add-in with the name of “Symbol and Characters”, click on the add button to install it. After that, go to the Add-Ins tab and open the add-in which you have just installed. At this point, you have a side pane where you can search for the checkmark symbol and double click on it to insert it into the cell. Here are a few points which you need to learn about using checkmark. Formatting a check mark can be required sometimes especially when you are working with data where you are validating something. Make it bold and italic. Increase and decrease font size. Deleting a check mark is simple and all you need to do is select the cell where you have it and press the delete key. Or, if you have text along with a checkmark in a cell then you can use any of the below methods. First, edit the cell (F2) and delete the checkmark. Second, replace the checkmark with no character using find and replace option. Let’s say want to count the checkmark symbols you have in a range of cells. In this formula, I have used COUNTIF to count the characters which are returned by the CHAR. A check mark is helpful when you are managing lists. And creating a list with check marks in Excel is no big deal now, as you know more than 10 methods for this. You can use any of these which you think is perfect for you. I hope this tip will help you in your daily work. But now tell me one thing. Have you ever used any of the above methods? Which method is your favorite? I’m locating the tick easily enough, but as soon as I leave the cell it changes to a rectangle shape. I can’t find a solution anywhere. HELP! What’s the font style you have there? How would you add a superscript or subscript to some text in a cell? ü;;û; will convert a one to a tick and a 0 to a cross, although you still need to convert the font to Wingdings. Thanks for sharing such a valuable information with us. I would like to ask that whether there is any formula which can convert numerical values into text.eg. Rs.2050=Two thousand and fifty rupees. ‘Place this code in the worksheet object, not a module. ‘Double-clicking any cell in the named range “Checkboxes” will toggle a checkmark to appear or disappear. You you are right but I believe you need a strong reason to use them. Another one would be from the Developer tab–Controls–Insert–Form Controls–Check Box. They’re a little bit trickier to center in the cell, but they work flawlessly. Hey Thanks Puneet, Its always fun reading your posts. I would tell one more way to insert a check mark. Set Font as “Wingdings 2” and type CAPITAL “P” it would give you “done check” or if you type CAPITAL “O”, it will give you “pending check” .